We shouldn’t put off until tomorrow that which we can start today. This is the final post in a series. Read the initial post, Week 1, Week 2, and Week 3. This is the fourth in a series. Read the initial post, Week 1 Progress, and Week 2 Progress. A set-back is defined as a reversal in your progress. This past week I experienced a bit of a set back, that I wrote about in my post on The Challenge of Slowing Down. I hurt my back, came down with strep and inflamed vocal chords, and was ordered to go home and rest my voice. Then came the fibromyalgia flare. And then word that one of my cousins, who is just a few years older than me, died unexpectedly. Talk about some stress on the body. This is what happens when you ignore the little voices in your head telling you to take it easy. Take a day off. Get some rest. If I had rested sooner, maybe I wouldn’t have developed strep and lost my voice, maybe I wouldn’t have gone into full fibro flare mode. This is the third in a series. Read the initial post and Week 1 Progress. Here is my Week 2 check-in of my 30 day personal challenge for the month of April. I have admired many of these bloggers for several years now, so I am grateful to be included amongst them. I have been working hard these past few months to be more deliberate, consistent, and relevant with my content, and write about what I know. And I feel my work is paying off! 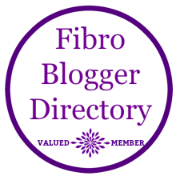 Author PhotobaughPosted on April 12, 2018 December 3, 2018 Format AsideCategories Blogging, LifestyleTags #ThankfulThursday, Blogging, Grateful, Gratitude, Personal Experience3 Comments on Thank you, FBD!